I wonder how these will integrate with touch? 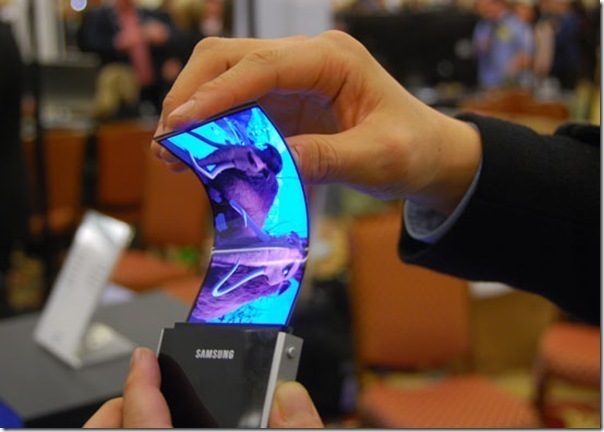 Samsung’s 2012 lineup of gadgets will include ones with flexible screens, the company announced during an investor call today. The company’s smartphones will likely get them first, possibly in the first half of the year. Samsung isn’t the first company to pursue flexible gadget parts, as Sony showed a flexible display in 2009 at the Consumer Electronics Show. But Samsung may be the first major device manufacturer to get them to market, and with its new dominant market position, flexible displays stand to get a wide release. The company’s pursuit of flexing screens stems from its purchase of Liquivista, a company that uses electrowetting technology to make screens that flex, but are still bright and low power. During the call, Robert Yi, vice president of investor relations, said that the company plans to introduce the displays “sometime in 2012, hopefully the earlier part. The application will probably start from the handset side.” Tablets and other devices will get the technology later. On the one hand, flexible displays mean that dropping your phone or tablet directly onto their screens may no longer be the disaster it currently is. However, Samsung has said little about how the quality of the displays will compare to the AMOLED screens the company usually favors in its higher-end devices, or even the oft-denigrated PenTile displays.The company also didn’t indicate whether the displays will only appear in all its devices, or only a subset.